Iowa’s scenic roadways and family-focused attractions make it a wonderful destination. In fact, it’s scenery is some of the finest in the Midwest. Whether you’re passing through or taking time off to explore the entire state, there are an abundance of beautiful campgrounds where you can stay the night. Briggs Woods is a gorgeous campground that’s situated on an 18-hole golf course. The nearby Boone River and Briggs Woods Lake offer swimming, fishing, canoeing, and kayaking. The campground itself features 30 full hookup sites, modern showers, a playground, and horseshoes. Rates range from $20 to $25 per night. Pilot Knob State Park is one of the oldest units in the state park system. It was dedicated in 1923. 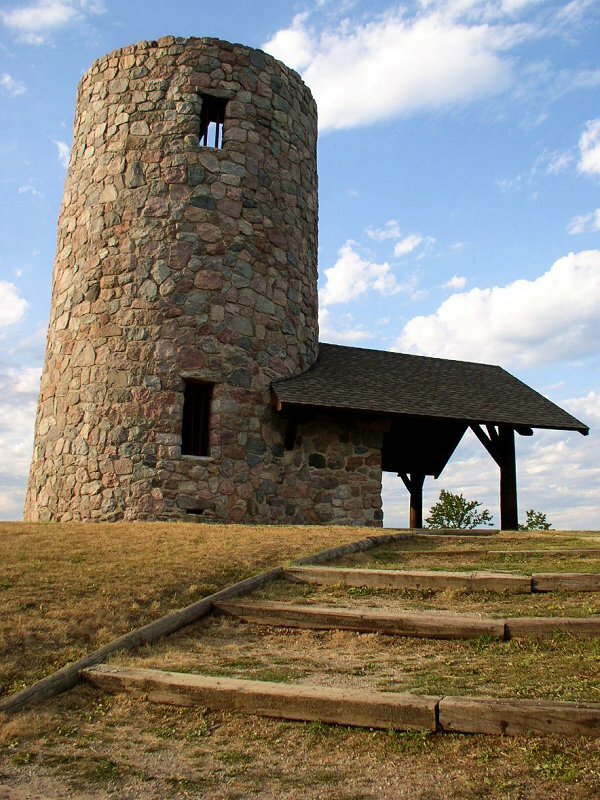 Standing atop the tower on “Pilot Knob,” visitors have a spectacular view. From the tower built by the Civilian Conservation Corps in the 1930s, one can see great expanses of some of the most fertile farmland in the world. After glaciers leveled the prairies of north-central Iowa, they deposited the rocks and earth that formed the hills and valleys that are now Pilot Knob. In earlier times, pioneers used the Pilot Knob as a guide as they traveled west in covered wagons, thus giving the park its name. An open air amphitheater, constructed by the Civilian Conservation Corps in the 1930s, is surrounded by scenic woods. The park has excellent trails for hikers and horseback riders. In winter, a warming house with electricity and heat provides comfort for ice skaters, snowmobilers, cross-country skiers and ice fishermen. Hidden within the 700-acre park and enclosed by abrupt banks is Dead Man’s Lake, a four-acre floating sphagnum bog, the only one of its kind in Iowa. This is a botanist’s delight, bordered by native trees, shrubs and flowering plants. Waterfowl feed and breed in the tall grasses. Three species of pond lilies grow here, one found nowhere else in Iowa. Trees native to the Pilot Knob area include walnut, ash, basswood, wild cherry, burr oak, aspen, white oak and red oak. Pilot Knob’s natural features are so significant, the majority of the park has been dedicated as a state preserve. Clear Lake State Park is located on the southeast corner of the beautiful 3,643 acre Clear Lake, one of the major outdoor recreation features of northern Iowa. Although the state park is only 55 acres, it offers a tremendous diversity of recreational opportunities due to its location on the lake as well as its natural beauty. This park is characterized by rolling ground with open, mature groves of oak trees. Several small draws and thickets provide habitat for owls, squirrels, opossums, raccoons, rabbits, many species of songbirds and an occasional deer. Scenic Woodford Island is a 3 acre island managed primarily for wildlife habitat and is an excellent spot for fishing. If you’re looking for RV rentals, RVshare has a handful of rentals in the Newton area. Then, head to the Newton KOA and enjoy a peaceful retreat for the whole family. It’s quiet and serene, yet full of things to do. The local pond offers fishing, while the campground pool is a nice place to take a dip. During the summer, they have weekend ice cream socials, fishing tournaments, and more. Campground amenities include fire pits, a meeting room, dog park, and a game room. Rates vary from $29 to $44 per night. If you’re looking for a family-friendly campground with plenty of space, Lazy Acres is the park for you. With 60 RV sites (29 of which have full hookups), and tons of activities for kids, your family will have more than enough space to spread out, run around, and enjoy the outdoors. Mini golf, paddle boats, fishing, and train rides are just a few of the things to do at Lazy Acres. Rates start at $33.50. Morwood Campground is a highly-rated RV park in northeastern Iowa. It has an average rating of 4-5 stars across Facebook, Google, and TripAdvisor. The park features large sites and pull-through lots, most of which have electrical hookups. All sites have water hookups. There are also two dumping stations, a laundromat, and a convenience store on the property. Families can enjoy hay rides, mini golf, horseshoes, volleyball, or swimming in the heated pool. Rates start at $27 for a site with water and electric. Just a stone’s throw away from the Iowa Great Lakes and area attractions, Fieldstone RV Park offers the perfect home base after a day of adventure. The Park itself abuts the Emerald Hills Golf Course and a public park and boat ramp. Amenities include full hookups, fire rings, a laundry room, and a clubhouse. For outdoor activities, you can head into town and visit the amusement park or race track, enjoy fine dining and shopping, or partake in watersports on the lake. If the weather takes a turn for the worse, you can head back to the RV and watch movies using the free Wi-Fi. Rates start at $35. You’re definitely going to want to spend a few days at the Red Barn Resort. This beautifully landscaped retreat offers a host of RV sites with full hookups and fire rings. It’s just a few miles west of Lansing, where you can enjoy boating, fishing, and swimming in the Mississippi River. Best of all, the campground has an on-site bar and grille inside an antique barn from the 1900’s. You can sit on the patio and enjoy a cold drink and a hot meal while the kids explore the playground below. How’s that for relaxation? Rates start at $30 per night for full hookups with 30-amp service. Shady Oaks is a privately-owned campground that’ll have you camping under the towering Bur Oak trees. As one of the oldest campgrounds in the state, its oaks have even made it into the Register of Famous and Historic Trees. One of the biggest draws of Shady Oaks is its massive, 12-level treehouse, where you and the family can get lost amongst the canopy and the maze of structures. It features running water, electricity, a grill, porch swings, and a spiral staircase. Park amenities include 13 sites with full hookups and pull-through spots for big rigs. Contact them for rates and reservations. On-Ur-Wa is a Good Sam Club RV Park, located just miles before you hit the Iowa/Nebraska state line. Onawa itself has quite a few attractions, like the widest Main Street in the U.S., the Historic Iowa Theater, and a handful of museums and places to shop. On-Ur-Wa has large, pleasant RV sites with full hookups. Tire out the kids at the recreation area, which features soccer, horseshoes, and more. Amenities include free wi-fi, laundry, RV supplies, and a small wine kiosk. Rates start at $32 for full hookups with 20-amp service. A short drive from Des Moines, Timberline is convenient to the city and surrounding areas. Nearby attractions include Adventureland, Science Center of Iowa, Blank Park Zoo, and, of course, everything Des Moines has to offer. Facilities include a game room, playground, pool, on-site store, volleyball and basketball courts, and more. Rates start at $44 for full hookups. Deer Run is a premier RV resort in northeast Iowa. It’s immaculately manicured grounds include room for RVs of all sizes. Each site is paved and includes full hookups, a picnic table, and a fire ring. The six-acre lake provides a serene backdrop to the greenery of the park. Deer Run has a beautiful bathhouse with heated floors, air conditioning, and laundry machines. Family fun awaits you down the street in Elkader with activities like archery, bowling, kayaking, shopping, and more. Rates vary from $35 to $41. ← The Best Fall Camping Locations to See the Changing Leaves!